Haha, I focused just on the school part of this topic as I haven’t been in the book blogging world for long and thus haven’t really been forced by you guys to read books. (And how do you define being “forced” anyway?) Anyway, here we go! 1984 by George Orwell: This is a classic, so I don’t think it needs much explanation. It’s just totally haunting and one of the best dystopians out there. The Great Gatsby by F. Scott Fitzgerald: I’m particularly happy that I read this in English class where we had to analyze symbolism and do lit crit, because I would not have done that reading it on my own, and then I don’t think I would have liked it as much. Anthem by Ayn Rand: So I think I read this in 8th grade or something, which is an absurdly long time ago, so I don’t thoroughly remember what this was about, but dystopia! Yes! And in this world they only talk about “we” – the pronoun “I” was lost. I mean, I mean. I love it. Really should reread. Brave New World by Aldous Huxley: I freaking love this book. I think it was my favorite required read. Dystopia is just totally my thing, and I loved the weirdo world in this book. It was also massively fun to analyze. Ishmael by Daniel Quinn: This is a bit of an odd one. It’s a philosophical novel, where a man answers an ad from a teacher looking for serious pupils and finds a gorilla. It was kind of strange, but it really made me think, and it was one of the only required reading books that I really blazed through and read eagerly. Fahrenheit 451 by Ray Bradbury: Do you see the dystopian trend? Yeah, I strangely didn’t, but, haha, I found that out later. This is just a must read, I think. The Assault by Harry Mulisch: YES! I was so excited in my IB English class that as one of the works in translation they picked this Dutch book! So I actually read it in Dutch! And got to comment in discussion about the translation and stuff. Anyway, a really good World War II historical fiction. I loved it. Pride and Prejudice by Jane Austen: No, I was like in the only English class that wasn’t forced to read Pride and Prejudice. You have no idea how upset that made me. I mean, I need an extra push to read classics, and P&P was like the only classic whose plot sounded even mildly interesting to me. So I did actually read this later on my own, and I loved it. The Catcher in the Rye by J.D. Salinger: I’m so sad I didn’t get to read this. I love The Perks of Being a Wallflower and everyone says that it kind of feels like The Catcher in the Rye – or at least that the two books could easily be paired together. So I need to get to reading this sometime soon. So… what do you think of my list? Which books are on yours? I didn't read Pride and Prejudice at school either. I wasn't actually required to read much for English which is a great shame! I'm reading Brave New World soon. Really looking forward to that one! I still really want to read 1984 and The Great Gatsby, just BECAUSE. I'm not sure if I'll have to read them for uni, they're not on this year's list at least, but we'll see. I do get to read P&P again, so I'm VERY excited about that. Also: I want to pick up The Catcher in the Rye as well, even though I'm a bit wary of it. I might really dislike the main character, but we'll see. And YES to The Giver. They have it at ABC and I'm so tempted to buy it every time. SOMEDAY! I wish Giver had been around when I was in junior high or high school so that I would have been forced to read it! 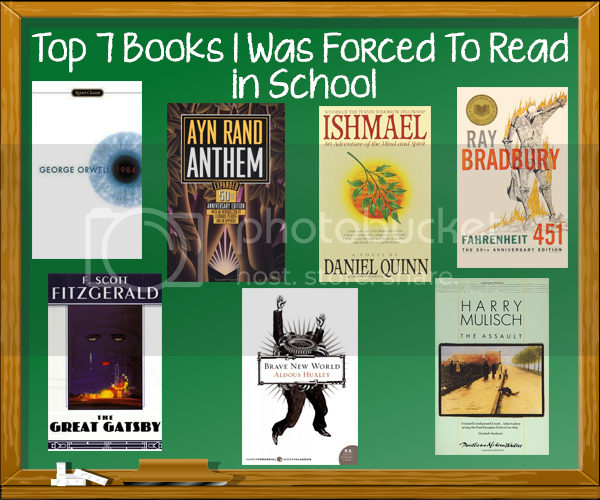 Here's my Top Ten Most Memorable Books I Was Forced to Read. 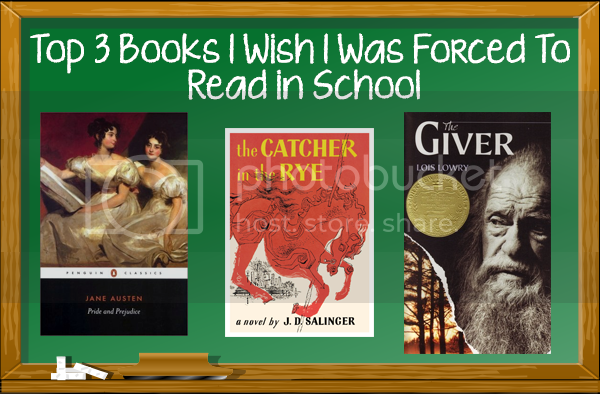 I wish that I had been forced to read Price and Prejudice in school as well! I actually didn't realize that this was required reading for people until reading other people's TTT posts today! Oh my gosh…Catcher in the Rye is probably in my top 5 least favorite books of all time. I was forced to read it for school at one point, and I absolutely hated it. And I LOVED The Perks of Being a Wallflower! As for the books you did read, I read Brave New World in college and loved, The Great Gatsby in high school and liked and Fahrenheit 451 in Middle School and liked a lot. But not the rest. So much love for 1984. I have yet to read Brave New World, but it's in my TBR pile. It was a school-wide summer read a couple years ago and the kids just raved. I've heard really really amazing things about Ishmael, but I've been hesitant to pick it up because I fear I am too shallow for it. Same with Ayn Rand. Actually with Ayn Rand it's more that whenever people tell me I must read it, they're usually being all pretentious and looking down on my YA choices so I've built up a wall of prejudice against it in my head which isn't fair to her books. Personally, I thought Catcher in the Rye is overrated as hell. I didn't read it in school, but ended up reading it because its one of those books everyone expects you to have read and it was short so I figured what the hell. While it wasn't terrible, it didn't impress me like I thought it would, I think it'd been way to over-hyped as a trans-formative reading experience. The Giver is awesome though. It's been awhile since I read it, but I recall really liking it. Fahrenheit 451 is my sister's favs but I have not read it yet. Great list! I read Anthem on my own and was glad I did, and same with The Giver, and like you, I wish I had been forced to read it in school! I, too, read The Giver when I was older, and I feel bad that I didn't pick it up sooner. I need to read F 451 – I skirted AP English, and I was never required to read until I enrolled in AP English when I was a senior. We were actually given more limited choices. I mean, for each grade of school we had maybe two books to choose from. In 7, it was The Secret Garden, in 8, it was Black Beauty and The Wind in the Willows, aaaand Great Expectations (which I really hated), in 9 it was Jane Eyre or Pride and Prejudice. We were assigned To Kill a Mockingbird that year, too. It was pretty good. After that we're kind of just restricted to either reading Charles Dickens or Shakespeare. Anyway, I would have loved to read The Giver or 1984.